One of the necessities of living in the Dominican Republic is a cell phone. Few homes have the good old hardwired phone that we grew up with in the States so pretty much everyone, including kids, has a cell phone here. You have a choice of either using your phone from the States of buying a new one here. Either way you are probably going to visit a cell phone shop. One of shops I’ve worked with quite a bit is Energy Cell in La Vega, Republica Dominicana. There is quite a variety of quality of phones available here. Cell phones can be picked up for a little as a quiniento or about $15 USD with the usual low end price being about 1500 pesos and the high end going over 16 mill (16 thousand pesos) for a blackberry or iPhone (at the Claro Store). The phones come prepared to be used here in the D.R so all you need to do is buy a provider chip, buy some minutes and you are ready to go. If you want to pick up a little higher quality phone (which really helps with all the text messaging you will be doing here) and yet not get stuck on an 18 month long contract your best bet is to pick one up used. You can often find relatively recent iPhones and Blackberries a small percentage of the new price at phone shops. The trouble is it is easy to get burnt. Poorly repaired phones mean constant trouble so you need to look for a reputable shop. In the States I always considered cell phones to be disposable. If it stops working it’s time to get the next generation. Here there is a thriving industry of cell phone repair to repair the damage caused by dropping the phone, getting it soaked in water etc. About the only thing that can’t seem to fix is if the phone gets dropped in salt water (too many circuits get fried by the salt water film). 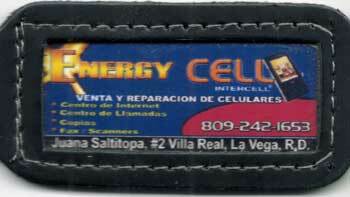 As I stated above Energy Cell in La Vega is one of the shops I’ve had good success with. Over the years we have purchased several phones from them and have had them repair phones. Repairs have included unlocking phones, replacing screens and fixing intermittent power problems with the phone. I also purchase a Toshiba Folio 100 tablet computer from them. Their staff is friendly and knowledgeable and they seem to do a good job with repairs. Another thing of interest, I am frequently asked if MagicJack works in the D.R. and it one can be purchased here. The answer to both questions is yes. I use MagicJack all the time for my business and for calls to my family back home and it works well with the relatively slow internet speed that you usually find in the Dominican Republic. Energy Cell tries to always keep a couple in stock, so you should be able to pick one up there.